With so much happening in Seattle's bustling music scene these days, how do you even know where to start? Allow the highly trained culture curators of Seattlemag.com to help with Band of the Week. 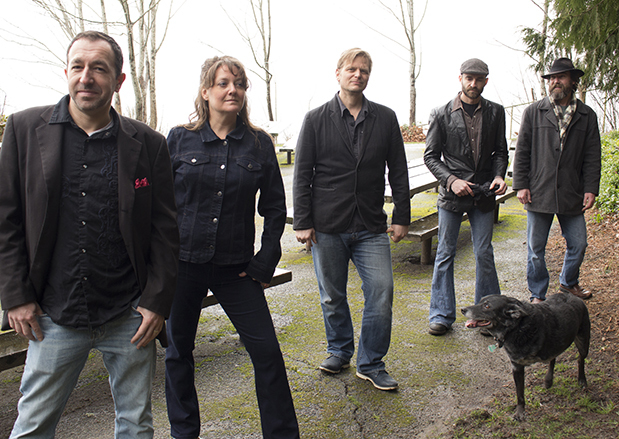 This week, we catch up with Joy Mills, singer/songwriter-in-chief of the Joy Mills Band. Her soulful country/roots ensemble has a new EP, Coming Up, dropping March 9th, followed by an official release show March 12 at the Hotel Albatross. In three sentences or more, tell us the story of your band: The band started in 2011 as a trio with myself [Joy Mills, guitar], Tom [Parker, bass] and Lucien [LaMotte, guitar/pedal steel] playing an opening set at the Triple Door. We've grown to a five piece in the years since, with Mike [McDermott, drums] and Jack [Quick, keys]. We also played in other projects way back in the aughts. It's pretty great to make music with your friends, like Willie said. And these bandmates of mine, they each write their own beautiful tunes, too, which has been a big influence on me. There's a lotta love in the notes. Tell us about the new project (themes, inspiration, personnel, release details, etc.) and/or what have you been working on these days? The new EP Coming Up (release show March 12 at Hotel Albatross) is our fourth recording. We started last summer and finished it over the course of the winter. Things felt good in the studio when we did the bulk of tracking, and there's a haunting but hopeful urge in the songs. Johnny Sangster did a beautiful job mixing and Julian Martlew did as well with mastering. It'll feel good to get the songs out there. What does being an artist/musician/band in Seattle mean to you? I moved to Seattle in 1999 as a fledgling songwriter with much to learn. One of the first things I did was buy a Martin DR at American Music, which I still play today. It has earned its worn spots, nicks and scratches, and a beautiful, woodsy resonance that deepens each year. That's my metaphorical answer. My plain answer is appreciating all the amazing and talented people I've been able to watch, play with and learn from. What BIG question should we ask, and what's the answer? Should people come to the show at Hotel Albatross on March 12? Yes. What’s next? Touring and summer shows. We'll be heading down the west coast in April and to Europe in the fall. This June, I'm putting together the 2nd annual Hammerfest in Georgetown. Five bands on a flat-bed truck. Classify these as good times.